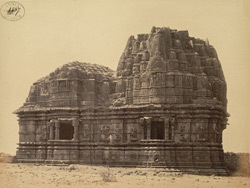 Photograph of the Surya Narayana Temple at Somnath in Gujarat, from the Archaeological Survey of India, taken by D.H. Sykes around 1869. In the report, 'Somanatha and other mediaeval temples in Kathiawad' of 1931, Henry Cousens wrote, "Outside the town, on the east, and placed upon an eminence overlooking the Triveni, or junction of the three streams, facing the rising sun, is an old temple of Surya...It [dates] perhaps, about 1350. The upper portion of its sikhara, together with the roof of the hall and the whole of the porch, have been thrown down...The forward part of the mandapa including the roof and front doorway, has been rebuilt in a clumsy fashion...On the front of the temple, above the entrance doorway, is an image of Surya with his seven horses below him and his two wives...and he appears again in the principal niches upon the outside walls...Around the shrine, in the circumambulatory passage, are three image niches, one on each of the north, south and west sides, which contain, respectively, Vishnu and Lakshmi, Brahma with Sarasvati or Savitri, and Siva with Parvati, much mutilated but easily identified..."